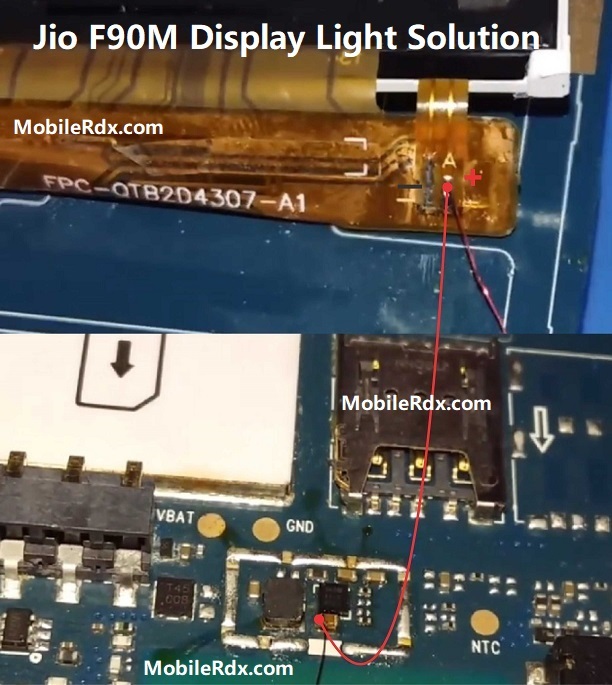 Here’s the dual sim LYF Jio F90M Display Light Ways backlight solution full LCD ways display connection line paths is case you are going to troubleshoot display problem such blank display, dark screen display, white screen (with tones), No backlight LED that is resulted from due to wet damaged or accidentally dropped issues bu the users. Manual Solution is basically only for low light and Backlight issue and in order to resolve that all you have to do is to go into settings and check for brightness (Remove check on Automatic Brightness). For Backlight, check backlight settings and timings. Check the LCD for possible damaged, cracked or broken. Replace if necessary. Check the device firmware, and do a self-test and calibration method. update or flash the firmware. Check the LCD pin connector for possible damaged. Clean, re-solder or replace if necessary. Now Check Continuity between Display connector to the resistor compounds. if any of then is track missing then make a jumper. If the above procedures don’t fix the problem the possible faulty is the main engine IC. Try to re-heater rework it.